If you like Korean beef, bulgoi, you will also love this version of crispy Korean beef. In Korean we call it bassak bulgogi, 바싹 불고기. 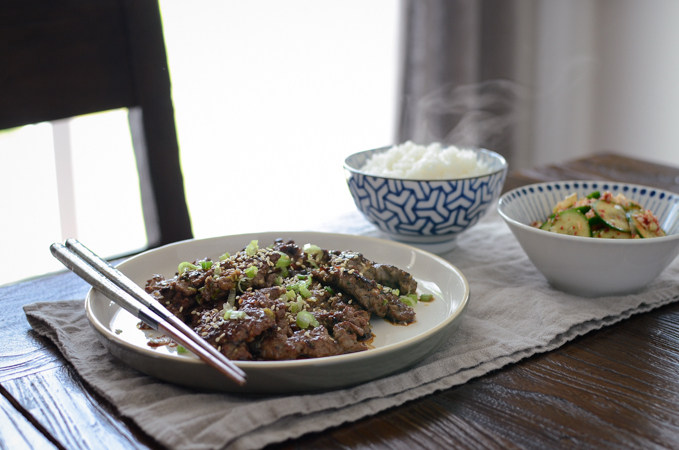 Unlike the traditional bolgogi recipe, which requires a long marinading time, you can make this crispy Korean beef as you prepare for dinner. The Korean word of “bassak” mean dry and crisp which this recipe offers. You don’t have to go to a Korean store to look for the extra thin bulgogi beef cut. Most grocery store carries thinly sliced beef sirloin for beef cutlet or pan fry recipes, and it will work better. 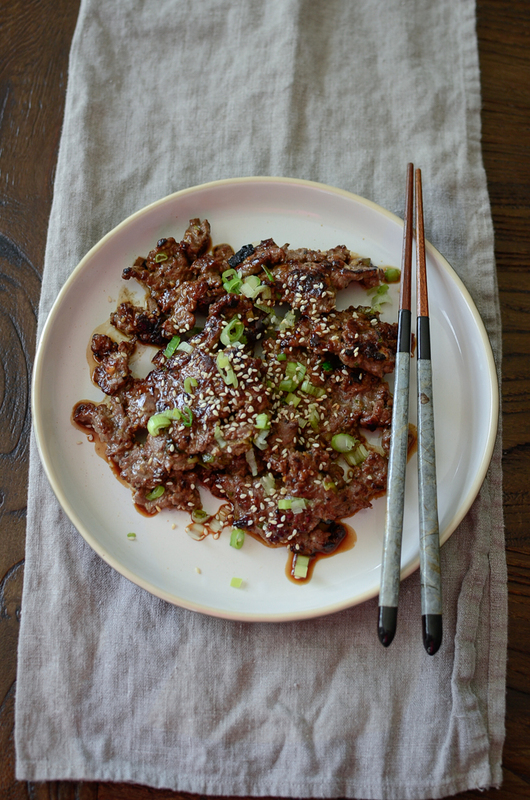 Try this recipe, and it will become your favorite Korean beef recipe. 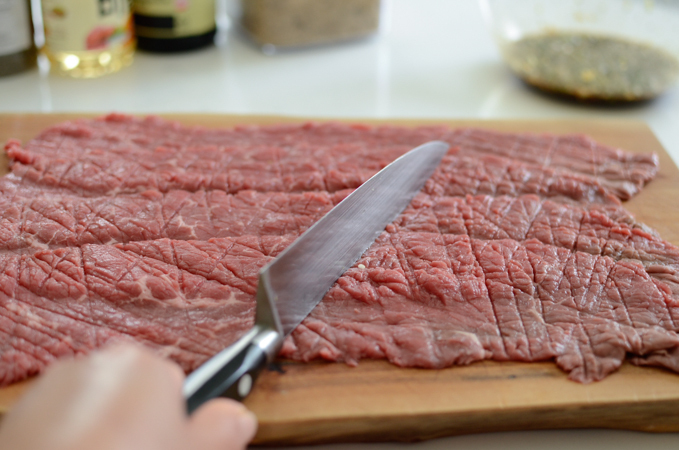 Spread the thin beef slices over the cutting board and pound with the back of knife a few times. Rotate the knife to different directions. You are not cutting through the meat but just give the scoring to tenderize. Flip the meat to the other side and do the same. Then gather up and give 3-4 cuts. In a mixing bowl, combine all the seasoning ingredients. Make sure to chop the green onion finely. Add the beef and mix together. If you don’t have any time, you can cook it right away, but I would suggest to let it sit on the counter while you are setting up the dinner table or preparing other dishes to serve with. 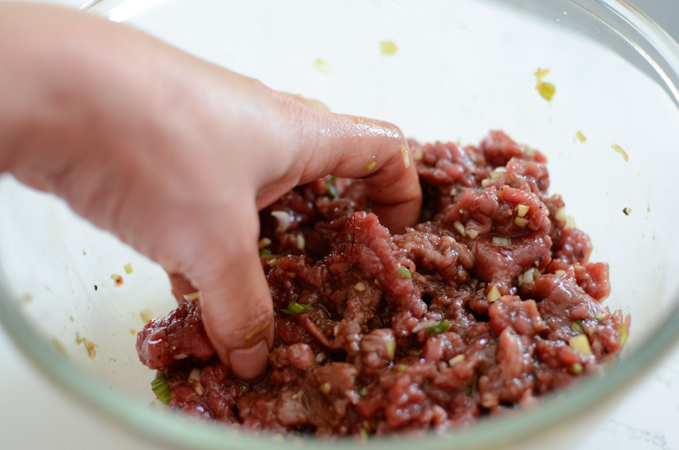 10-20 minutes of sitting time will help marinade the meat to produce tenderer and more flavorful bulgogi. When everyone is ready to eat, heat up the heavy bottom skillet over medium high heat. Drizzle a little oil and spread the meat mixture thinly. It should sizzle immediately. Cook for 1-2 minutes, then flip and cook for another minute. This crispy Korean beef cooks up super fast. Serve hot with rice and simple side salad dish. 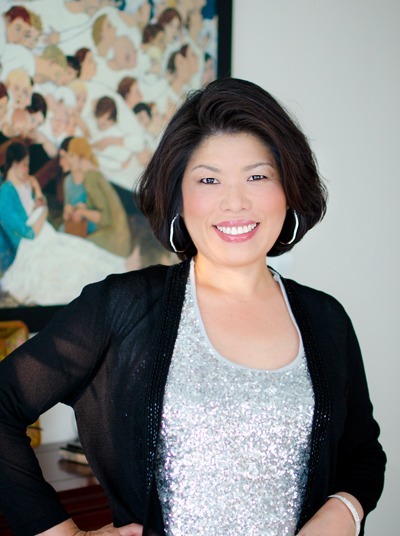 I served mine with a simple Korean cucumber salad, and it was just perfect. You will love the texture of this bulgogi, crispy at the first bite, then soft and chewy texture that follows after. 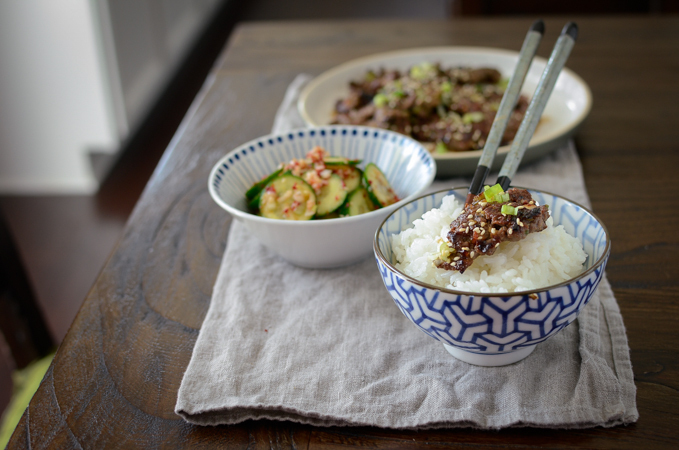 If you are a bulgogi lover, you will adore this recipe. Try out! 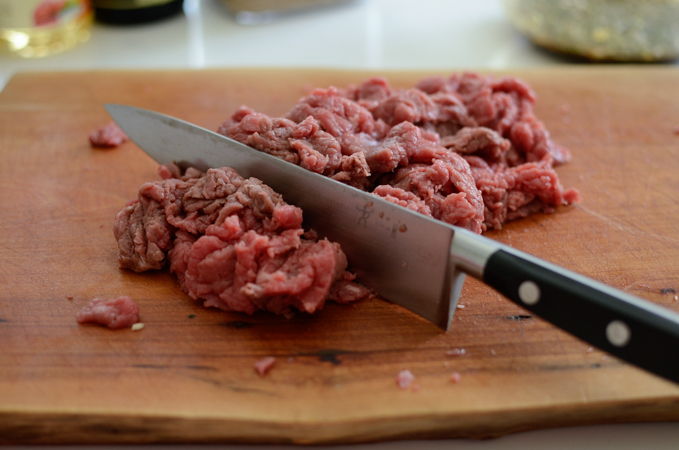 Spread the beef over the cutting board and pound strong with the back of your knife all over the meat. Do not cut through. Flip the meat to the other side and do the same. Gather up the meat and cut 3-4 times. 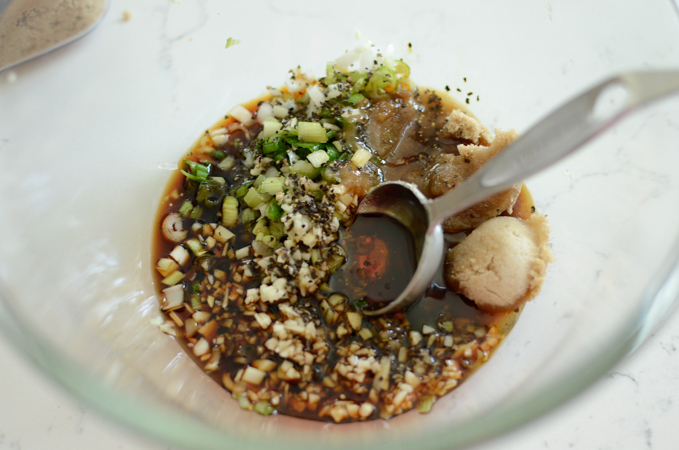 On a large mixing bowl, combine the rest ingredients except the oil; mix well. Add the beef and toss to coat as you are kneading the meat. Let it sit on the room temperature for 10-20 minutes. Heat a heavy bottom skillet until very hot. 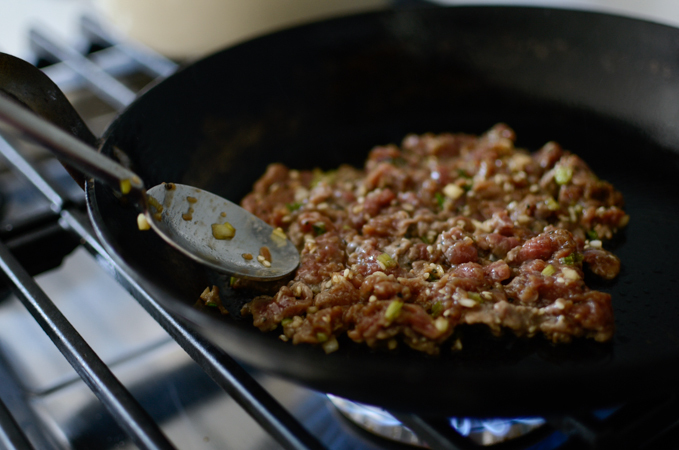 Drizzle a little oil and spread a few tablespoonful of meat mixture thinly onto the skillet. It should sizzle immediately. Cook for 1-2 minutes, turn to the other side and cook for another 1 minute. The meat should have some caramelized surface. Serve hot with rice and simple side salad. Enjoy! Love bulgogi! 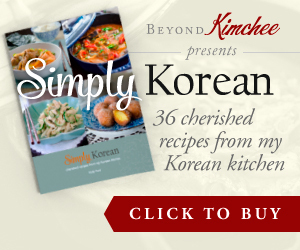 Can't wait to try this, along with your jap chae and kalbi rib recipes.